This module is intended as an introduction to the basic principles of SCI management appropriate for all members of the multidisciplinary team. It covers topics such as prehospital care, acute medical care, management of vertebral lesion, management of bladder/bowel, management of complications, psychological support, comprehensive rehabilitation and the role of different health professionals. This module is intended for doctors with a good understanding of medicine but little prior experience in SCI. It covers topics such as management of unstable vertebral fractures, autonomic dysreflexia, spasticity and respiratory failure. This module builds on key concepts covered in the "Overview for the Whole Team" module. This module is intended for student and graduate nurses who have some practical nursing experience but are new to SCI. It highlights the unique role of the nurse in the rehabilitation process and the key features of nursing people with SCI. The topics covered include introduction to the concepts and role of nurses, spinal precautions and managing skin integrity. This module covers 5 topics including assessment, setting goals, formulating treatment plans and administering interventions. The submodules include videos, case studies and interactive activities. The module focus on occupational therapy skills which are specific to SCI. It encourages users to problem solve and use local materials and resources for aids to assist independence. This module covers 14 topics including assessment, setting goals, formulating treatment plans and administering interventions. The submodules include videos, case studies, interactive activities and interviews with physiotherapists from around the world. The module focuses on developing problem-solving skills. Learners are required to devise treatments for patients with different clinical problems. This module explores the causes of SCI throughout the world. It looks at the influence of transport, work and sport on the incidence of SCI in different countries. It also outlines appropriate strategies for preventing SCI. This module will be of interest to anyone working in the field of SCI but is primarily intended for policy makers and government officials. This module is intended for psychologists, social workers and peer counselors new to the area of SCI. However, all team members would benefit from a better understanding of the psychological and social implications of SCI. This module covers a diverse range of topics such as adjustment to disability, depression, anxiety, sexuality, finances, family and community support. It includes a variety of case studies from countries around the world. This module has been developed for and in close collaboration with the SCI consumers. 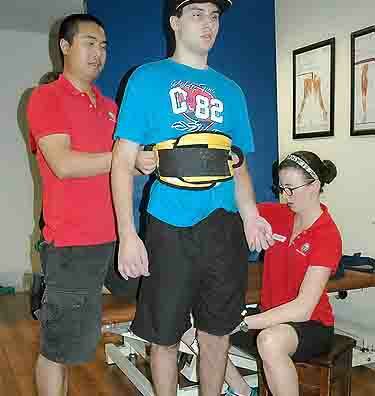 Education about the injury is an important component of a comprehensive rehabilitation for person with SCI.